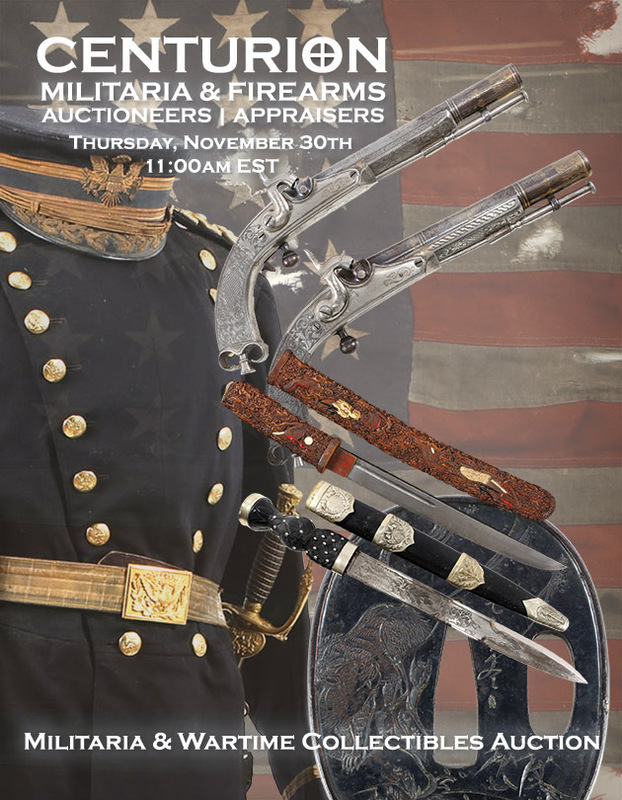 Military Wartime Collectibles Auction - Selling an extensive offering of wartime military collectibles, to include: Civil War, Indian Wars, World War I, World War II, Vietnam, and most other 19th & 20th C. Military Conflicts. Items are consigned from estates, individuals, lifelong military collections, and private collections across the United States. Online Catalog is posted now and available for absentee / pre-bidding. 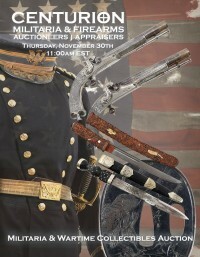 Register and Bid Now on more than 800 Lots of Military Wartime Collectibles. Live auction and auction webcast for real-time online bidding begins at 11am Eastern on Thursday September 30th 2017. - EXTENSIVE COLLECTION OF JAPANESE EDGED WEAPONS & ACCOUTREMENT, Lots 25522 through 25670: Consisting of consignments from 3 large private lifelong collections and being one of the finest offerings of Japanese Edged Weapons and related Japanese Accoutrements to market, the comprehensive offering includes Mounts, Kashira, Fuchi, Menuki, Tsuba, Jitte, Kozuka, Percussion Pistol Tanto, Tanto, Wakizashi, Shin-Gunto and Katanas. Many early signed pieces, and most finely crafted with utmost attention to detail. - LIFELONG COLLECTION OF A CIVIL WAR RELIC HUNTER - DR. W. CULLEN SHERWOOD, Lots 25002 through 25085: Collection of Dr. W Cullen Sherwood - Geologist, Historian, and Civil War Relic Hunter. Dr. Sherwood was a Geology professor with a lifelong passion for the history and material of the American Civil War. Growing up in rural Virginia his interest in Civil War Relics spanned his lifetime. He was well-known for his captivating field trips, where he would regale students with stories that linked the geologic landscape with Civil War troop movements and actions. He developed his relic collection as a true scholar, studying maps and other archival information, combined with his extensive knowledge of the capabilities of various weapons, tactics, and movements. Dr. Sherwood carefully documented all discoveries throughout his collection. These studies led Dr. Sherwood to many little-known locations, where he enjoyed meeting private landowners while asking permission to access their property. All of Dr. Sherwood’s material originated on private land. The Sherwood American Civil War Relic Collection is large and comprehensive, representing decades of careful study, a strong passion and in-depth knowledge of history. By Appointment: Please contact the gallery to schedule. A list of lots wanting to be viewed must be furnished in advance of your visit.